N and I met partially because we both biked. More accurately, I was looking at the personal ads and circling ads with the word “biking” in them. This was back in the day before online dating. The stone ages where the Chicago Reader had actual print ads, and the person placing the ad could opt to have a recorded message to talk about themselves a bit more, and you could email or voice mail the person you were interested in. N still has a copy somewhere of my message to him. I asked him which Muppet was his favorite. Anyway. Biking. We biked on our third date. We biked quite a bit during our kid-free years. We bought a house a block from a major biking path. I dream of a vacation where the whole family bikes down the path next to the Danube. My 82-year-old uncle still bikes. He’s cool. When I was pregnant, I didn’t bike. Seemed too risky. When the kids were under a year, we didn’t bike with them. Too risky with their weak little necks wobbling under the weight of the helmets. Then we bought a bike trailer, and we used it some. Then we got two kid seats that go on the back of the adults’ bikes. Then we got two Trail a Bikes . It’s complicated because the kids are always changing size. Have you noticed that? Currently we’re doing pretty well with the two Trail a Bikes. Nea started using hers a full year younger than Boo did. That “my sister is so cool and I want to be just like her” thing is really working for us. For shorter trips, they use their own bikes, of course. It's the longer trips where they need some help. 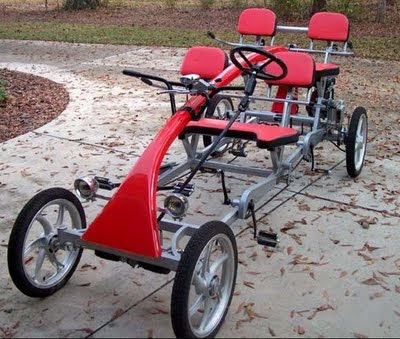 Anyone have a full-sized tandem they don't want anymore? We're thinking that might work for us in a few years.